To really see a city its always best to explore it on foot. No matter how good a tour bus and guide maybe, the satisfaction of discovering a place for yourself is one of travels great joys. Sketches is going to feature London heavily this year and what better way to look at this amazing city than offer some fun and interesting; off the peg walks. Today's walking tour is a simple circular route, that could either take a couple of hours or the whole day depending what you do. 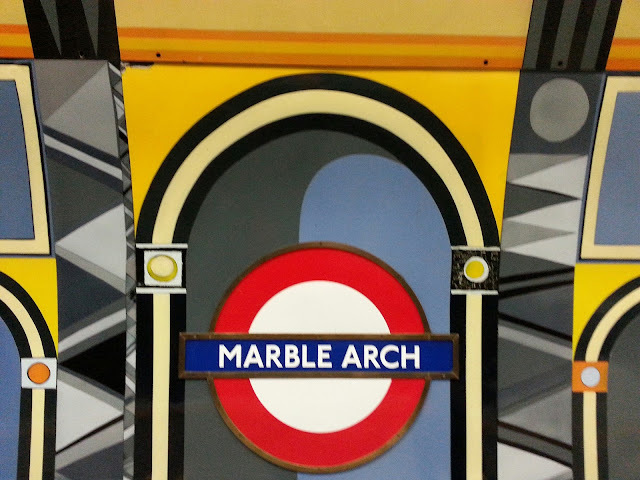 Your starting point is at Marble Arch (on the Central line). Take in the arch and then head down Park Lane. On route you can look at the opulent houses and hotels. Look at the car showrooms and dream of driving off in the latest Aston Martin. At Park Lanes end is the Wellington Monument. Going through the walking subway tunnel to the monument gives you an artistic history lesson about the Duke. So make sure to allow some time to look at the artwork and read the history. Once done its a slow walk down Piccadilly. If you dare there are some hidden treasures to be found off-piste. Cafes and exclusive shops are waiting for you. You'll also find some more famous places (see below) and a number of boutique shops or have a browse around the Royal Academy of Arts? Plenty there to keep you occupied. The Worlds most famous hotel? Once you reach the circus you need to head up Regents street and then along Oxford and Bond Street, taking in some of London's premier shopping haunts. Just off Regents Street; along Heddon Street in fact, is the shrine to the late David Bowie (see below). Then once you've paid your respects how about a visit to Hamley's for the kids (or adults, lets be honest). Onto Oxford street and the end is then insight. Its the little climb up the slope in Bond street back to the Arch, passing Selfridges as you go. The memorial to David Bowie - the exact spot where the famous front cover for Ziggy Stardust was taken. Its a simple to follow walk (there are signs) but one that will reveal many of London's treasures. The contrast from the expensive shops of Mayfair to the sudden switch of the mainstream in Regents Street is all to clear to see. Selfridges, Fortnum and Masons gives way to the high street named brands. Whatever your tastes or budget this is a walk that all should try, whatever the weather. Happy walking! If you have a highlight in any of these areas you'd like to share, then please drop a comment. It'd be great to hear about your favourite places.